Google on the Internet is always helpful for answering such questions. If eddy current is entered as a search term, this results in more than 120,000 hits, which is rather a lot and indicates that eddy current is fairly well known. From our everyday lives we know that there are materials which conduct electric current, like for example cables. These electrically conductive materials are mostly metals like copper, brass, iron and steel. If such materials are brought into a magnetic alternating field, the magnetic field penetrates the material and causes eddy currents within it. They are called “eddy” currents because they usually move on curved lines in the electrically conductive materials and move back and forth to the rhythm of the stimulating magnetic alternating field. So they do have something “eddy” about them, which is why their name reflects their behaviour. Now the electric current is essentially nothing else than the movement of negatively charged electrons in the conductive material. This means that our eddy currents are electrons moving back and forth in the material. Compared to everyday life the material could be a large city, with the electrons moving about like people. In non-destructive test methods, eddy current technology increasingly gains in importance. The reason for this is that it is a test method that is flexible in its application and that its probes, usually coils of copper wire, are very adaptable and can be produced fairly easily. Usually, people that move cause something. Is it the same for electrons? The answer is: Yes. Their movement, which is a cur- rent – the eddy current -, causes a magnetic alternating field on their part, which opposes the stimulating magnetic field and weakens it. This magnetic alternating field created by the eddy currents is called secondary field, which occurs as a result of the stimulating magnetic field. The stimulating magnetic alternating field is the primary field. The primary magnetic alternating field is usually created by coils carrying alternating current. These ensure that the primary field enters the material and stimulates the eddy currents. This causes “stimulated” electrons to move back and forth on curved lines. The higher the electrical conductibility of the material, the better the functioning of the eddy current generation. 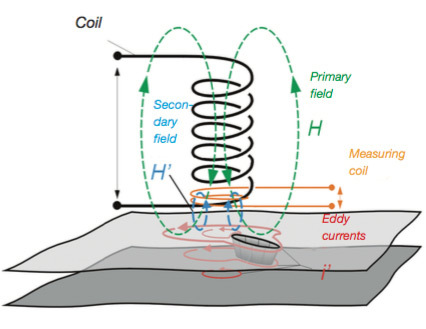 The eddy currents themselves are not passive and create a secondary magnetic alternating field due to their movement, which weakens the primary field and can thus be detected outside of the material. The secondary field can thus give evidence of the behaviour of the eddy currents on the inside of the material. Large cities have it a little easier, as traffic and pedestrian movements can be monitored by video cameras. But the secondary field can also respond quite sensitively to disturbances in the material and is thus a suitable verification tool. Why can eddy currents be used for non-destructive tests? an obstacle affect the electrons in the material? The electrons cannot move across the obstacle, so there is no eddy current here. This also means that there is no secondary magnetic field at the site of the obstacle, which in turn also means the primary stimulating field is not weakened. This implies that flaws in an electrically conductive material can be detected via the amplitude of the magnetic alternating field resulting from the overlay of stimulating field and secondary field. If the electrons are forced to make a detour due to the obstacle, which requires additional time, this means that – compared to the uninterrupted case – there is a time shift between the primary and the secondary magnetic field. This is called a displacement of phase between the two fields. This can also be measured. he frequency range up to a few megahertz are used. Usually, the analogue signals from the probes are transformed to digital signals, so that the eddy current signals can be analysed quickly and easily. As these are electromagnetic signals, their effect is quick, and high test speeds can be achieved. The signals and their processing and analysis enables the creation of fully automatic eddy current test systems for online or inline testing of work pieces during production.